Most of Manhattan Beach neighborhoods have quaint nicknames like the tree, sand and hill section. East Manhattan Beach however has never earned a distinguished name until now: Manhattan Knolls. Why call it Manhattan Knolls? When you look back at the many historic photos of Manhattan Beach before it was extensively developed you can clearly see that much of the area East of Sepulveda was built over a series of small rolling hills (knolls). A large property East of Meadows once owned by the Kuhn family was called The Knoll but the neighborhood was never officially named as such. Because all the neighborhoods have been mainly named after a physical characteristic, it only seemed right to choose the dominant topographical feature of East Manhattan Beach and use that as it its proposed name. Click to read the August 24th, 2018 article. WHY ATTEMPT TO GIVE EAST MANHATTAN A NAME? When you speak to residents and ask about the new name you will quickly find instant support. Residents have stated that it’s like having a child without a name. Who would do that? You wouldn’t call your third born, “The third one”. Why call this part of town, “The East one”? There is nothing particularly wrong with being called East, but many residents expressed that it just doesn’t resonate as a place you want to call home. With the proposed name in place, imagine someone asked you where you lived; how would that conversation go? HOW DID THIS NAME CREATION COME ABOUT? George Reppucci, a 30 year East Manhattan Beach resident, a published Manhattan Beach history researcher, and a retired Northrop Grumman/TRW program manager, knew that local real estate agent Ed Kaminsky of Strand Hill Properties not only lived in several homes in “Manhattan Knolls” but also sold more of these homes than anyone else to his clients. In addition, Ed still chooses to live East of Sepulveda given all of the choices he has. George approached Ed with his personal disappointment of living in an area named after a point on the compass. Ed and George immediately put their heads together to find out both how the city politicians, local historians and of course local residents felt about it. It was immediately clear that there was an absolute wave of support in giving East Manhattan a name. Manhattan Knolls was suggested and the plan was born to move it into reality. Click to read the August 24th, 2018 -front page article. WILL THIS NAME ENHANCE THE VALUE OF MY PROPERTY? What drives the value of any real estate is of course supply and demand like any other product. The largest draw for Manhattan Beach home buyers, besides of course the perfect Southern California climate, is certainly the excellent school system. Any community that offers great education tends to fare better on appreciation of real estate values. In addition is the community “feel” that is rare to find in Los Angeles, from home town fairs, fireworks display during year end holidays, the many community gatherings like The Friendship walk that serves all of the local schools as well as special needs children and their families. Truly, the list is endless of great reasons to live and own property in Manhattan Beach. The Manhattan Knolls name could certainly have a positive effect on how the neighborhood is perceived and that could drive increased demand. Increased demand could have a very positive long term effect on home values. It may not be immediate and it may not be noticeable but long term it certainly could have an influence. It certainly wouldn’t have any negative affect on the value. So whether you prefer to leave things just the way they are or prefer to embrace the suggested name change your vote and opinion is appreciated. VOTE TODAY. 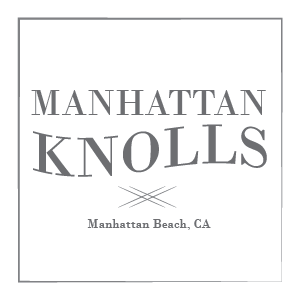 Send us an email with your thoughts, ideas or questions about the new Manhattan Knolls!